I have updated my national housing bubble graphs to reflect the latest data available. 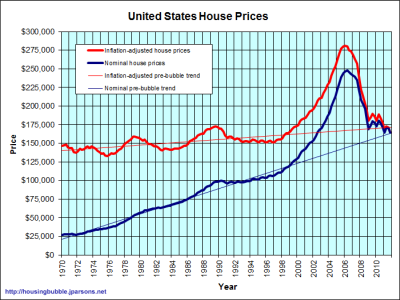 It covers home prices from 1970-2011. It looks like U.S. home prices are fairly valued, although it varies by metro area. As I said in the past, I don't expect any significant overshooting nationally. I stick by that prediction. 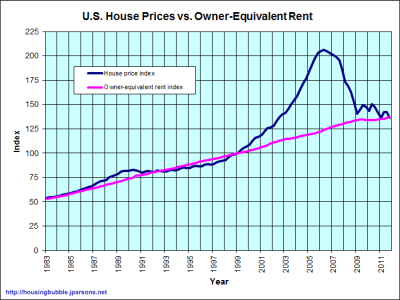 Very Interesting data, as you mention in graph 2 the home price and owner equivalent rents approx are same in 2011. 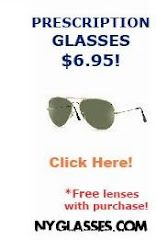 Please let me explain what does it mean! The macro perspective of these graphs are pretty startling. We won't see dramatic improvement to real estate prices over night, but I have a feeling the short-term version of this graph wouldn't be quite so scary.